This highly collectable Roman Silver Tetradrachme is a genuine piece of antiquity. Nearly two thousand years old, this historic coin was issued by the Roman Emperor Nero – one of Rome’s most colourful and notorious emperors. Nero was undoubtedly vain, cruel and ultimately inadequate as emperor, but he was supremely successful as a patron of the arts. Nero provided hundreds of artists and craftsmen with work. Throughout his life this love of art combined with his overarching egotism resulted in the most incredible creations. Nero’s own palace, the Golden House, for example, featured a revolving dining room and a 35-metre high statue of the Sun God with Nero’s features. This Silver Tetradrachme also tells another story about Nero and the Roman Empire. 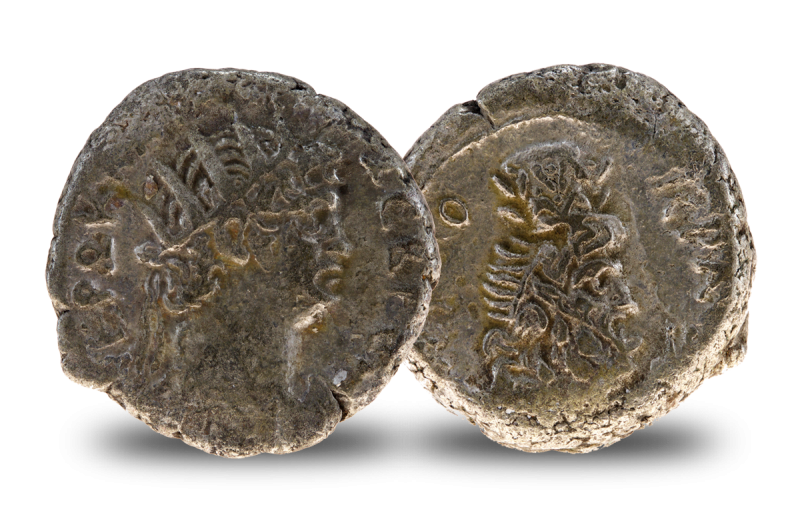 It was minted in Egypt at the Roman mint in Alexandria. Egypt had been under Roman control since around 80 BC, but it wasn’t until Octavian (later the Emperor Augustus) seized it after his victory against the infamous Mark Anthony and Cleopatra, that Egypt really become part of the Empire. And it was a supremely important part, providing much of the gram for Roma. The Alexandrian Tetradrachme, with their Greek inscriptions and depictions of Greek inscriptions and depictions of Greek, Roman and Egyptian heroes, spirits and gods on the reverse, some even featuring Nero’s wife Poppaea, are a powerful reminder of the melting pot that was the Roman Empire in the first century AD. This genuine Roman Silver Tetradrachme issued by Emperor Nero was hand struck by placing a cast bronze disc (planchet) between two metal dies engraved with the obverse and reverse designs. The dies were then hit with a sledgehammer. Differences and cracks in the dies, variations in how the planchet was placed, how well and how many times it was struck mean that every Roman coin is absolutely unique. Moreover, these were coins used for everyday commerce; handled and worn by a myriad Roman and Egyptian hands it is a very special reminder of that ancient and enthralling world.